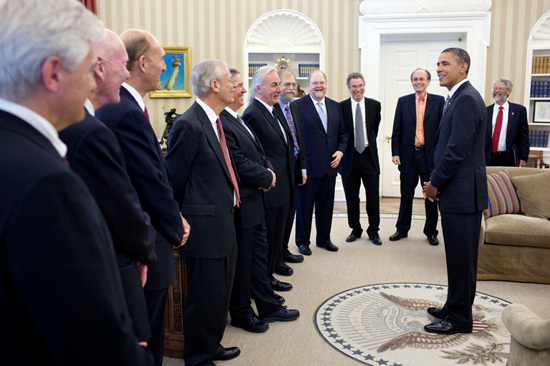 At the White House on Monday, President Barack Obama met in the Oval Office with UC Santa Cruz astronomer Jerry Nelson and the six other U.S. recipients of the 2010 Kavli Prizes to recognize and honor their seminal contributions to the three fields for which the prizes are awarded--astrophysics, nanoscience, and neuroscience. Joined by the President's science advisor, John P. Holdren, President Obama greeted Nelson, a professor of astronomy and astrophysics, and the other Kavli Prize Laureates: Roger Angel (University of Arizona), Donald M. Eigler (IBM Almaden Research Center), James E. Rothman (Yale University), Richard H. Scheller (Genentech), Nadrian C. Seeman (New York University), and Thomas C. Südhof (Stanford University). Accompanying the laureates were Fred Kavli, founder and chairman of the Kavli Foundation; Robert W. Conn, President of the Kavli Foundation; and Wegger Chr. Strommen, the Norwegian ambassador to the United States. The Kavli Prizes are a partnership between the Kavli Foundation (U.S.), the Norwegian Academy of Science and Letters, and the Norwegian Ministry of Education and Research. "We are extremely grateful to the President for the honor of this visit, and for his strong and heartfelt commitment to scientific research and discovery," said Fred Kavli. "It reflects the nation's deep support for innovative research that scientists across the country rely upon, including the foundational research discoveries of the 2010 Kavli Laureates." The Kavli Laureates received their awards for research that made it possible to look more deeply and clearly into the universe, to control matter on the nano scale, and to understand how the brain's nerve cells communicate. The 2010 Kavli Prize in Astrophysics was awarded to Nelson, Angel, and Raymond N. Wilson of the European Southern Observatory in Germany for their contributions to the development of giant telescopes. The size of a telescope's primary mirror determines the light-gathering power and ability to detect and resolve the faintest and most distant objects in the universe. Nelson, Wilson, and Angel pioneered the development of a new generation of large optical telescopes with innovations such as precise reflecting mirrors and more sophisticated shaping that has led to an extraordinary range of fundamental discoveries about the cosmos. The 2010 Kavli Prize Laureates were announced last year and received their awards in a ceremony held in Oslo, Norway.